One of the six fishers is released on Wednesday December 5, 2018, at the North Cascades Visitor Center in Newhalem. Fishers are among the lesser known carnivores native to Pacific Northwest forests. John Jacobson / WDFW, file photo. An elusive carnivore in the weasel family is roaming free in Washington’s North Cascades for the first time in at least 70 years. Federal and state wildlife biologists on Wednesday released six fishers captured and relocated from Alberta. One by one, the six furry fishers sprinted out of their wooden boxes into the mossy forest of the Ross Lake National Recreation Area near Newhalem. A crowd of more than 50 excited onlookers on a trail above mostly suppressed their cheers and applause until the last release was complete in order not to scare the animals. Singers and a drummer from the Lummi Nation tribal school sang in the background to wish the fishers a good journey in their new home. "It is good to see us finally giving something back," said Frank Bob, policy representative for the Lummi Natural Resources Department. "For so long, I've seen things coming out, being taken. But I haven't seen very much put back." "This is a big thing. Mother Nature is praising us today." A reintroduced fisher sprints to freedom near the North Cascades Visitor Center in Newhalem. Fishers were once widely distributed through the forests of Washington and Oregon. But fur trapping, indiscriminate poisoning of predators and logging wiped them out in this region in the early decades of the last century — except for a remnant population in southern Oregon, according to state and federal biologists. Reintroduction efforts in Washington state began 10 years ago and now have come to the North Cascades, where Jason Ransom is the lead National Park Service wildlife biologist. Ransom’s son Liam, who tagged along for the releases, said he would long remember how the six fishers took off like rockets into the forest when other fourth graders opened the doors of the transport boxes. “They’re like a wolverine, but kind of longer, skinnier, with a longer tail,” the younger Ransom observed. "They're really cute." National Park Service biologist Jason Ransom got help on Wednesday from fourth graders to release relocated fishers near Newhalem, Wash. The transplanted carnivores all had small radio transmitters implanted under their skin to monitor the success of the reintroduction. The park service, the state and outside partners hope to release about 80 Canadian fishers over the next few years to rebuild the population in the North Cascades. "It's a healing story. It's fixing a wrong," said Dave Werntz, the science and conservation director with the Bellingham-based nonprofit Conservation Northwest. That group along with other donors, including the Calgary Zoo and Northwest Trek, are supporting the federal and state-funded reintroduction effort. Jeff Lewis, a lead state biologist with the Washington Department of Fish and Wildlife, described the North Cascades releases as the third phase of fisher reintroduction, following previous releases on the Olympic Peninsula and in the South Cascades. From 2008 to 2010, the National Park Service, the state wildlife department and partners released 90 fishers from central British Columbia in Olympic National Park. Follow-up monitoring shows the released animals are reproducing and doing pretty well. Beginning in 2015, 69 more relocated Canadian fishers were set free in Mount Rainier National Park and near Randle, Washington. "If we can get them restored here, we'll have gotten populations restored in the three major areas of their historical range," said Lewis during introductory remarks at the North Cascades Visitor Center Wednesday that turned surprisingly emotional at times. "That would be a huge conservation win for all of us." The Oregon Department of Fish and Wildlife successfully reintroduced a second population of fishers near Crater Lake National Park between 1977 and 1981 to supplement the remnant population that survived in the Klamath Mountains of southwestern Oregon and northern California. In 2015, ODFW published a feasibility study that concluded fishers would be good candidates for reintroduction to more of the Oregon Cascades and to the Coast Range. The house cat-sized carnivores prey mostly on small mammals such as snowshoe hares, squirrels, mountain beavers, rodents and are one of the few predators of porcupines. They don't, however, eat fish, despite that being in the animal’s misleading name. 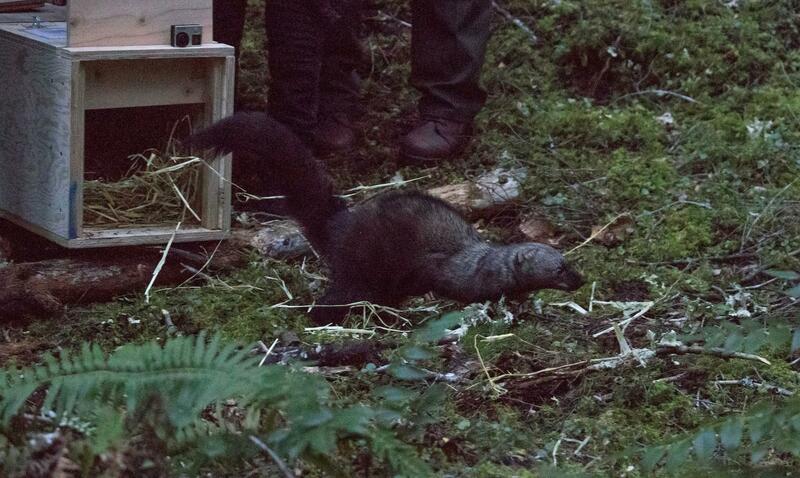 Since 2008, wildlife biologists in Washington state have worked to reintroduce the fisher, a locally-extinct forest weasel. They are not shouting from the tree tops about success, but say things are looking positive. Fishers were previously reintroduced in the southern Oregon Cascades. There’s no way to know for sure how many fishers lived in the Cascades historically, because the small brown mammal was almost entirely eradicated by trappers by 1930. But this week, there’s evidence that they are reproducing.